A Cherry Gray for These Gloomy Days! These rainy days and cold weather put me in the mood to search for a nice gray nail lacquer. Since fall has already passed, and we are smack dab in the middle of winter, I knew I did not want a dark gray. 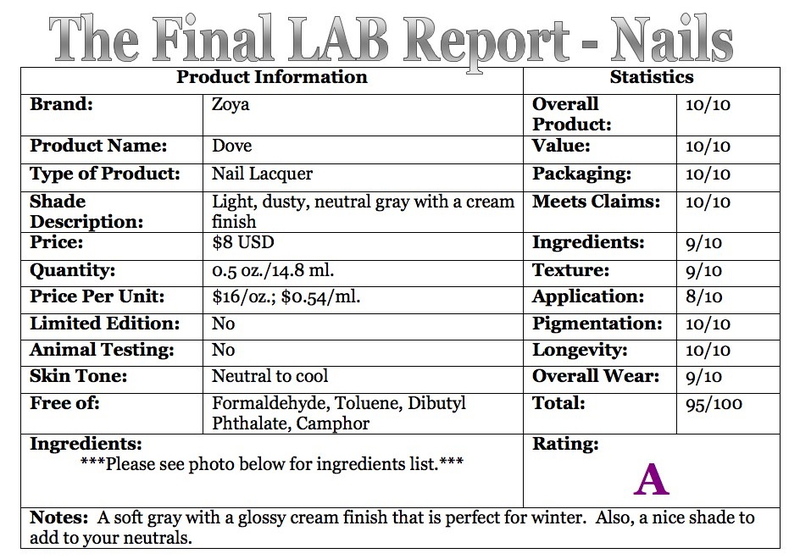 When I came across Zoya Dove Nail Lacquer ($8 USD for 0.5 oz./14.8 ml. ), I knew I had met my match. It was originally released with the Intimate collection and the company describes it as a “soft, delicate light neutral gray with an opaque, glossy creme finish.” To me, it is a light (but not pastel) dusty gray with a cream finish. It is neutral, as it leans neither warm nor cool. Zoya’s website states this color’s intensity as a 4 (1 = sheer – 5 = opaque). The texture of this lacquer was a little on the thick side-not unusual for Zoya’s cream finishes-but it was not so thick that it was gloopy or difficult to get an even finish. What did make application difficult was the brush. For some reason, the bristles were splayed. None of my other Zoya nail polishes have splayed brushes, so I am assuming this was an anomaly. Dove was fully opaque in two coats and dried to a nice glossy finish. I love how shiny Zoya’s polishes look, even without a topcoat. In the swatch photos it looks like you can see the white part of my nails, but it is just the way the light is hitting it and the way my nails grow (weird, I know!). This lasted seven days with just minor tip wear and no chipping! I used Zoya Anchor and Zoya Armor for my base and top coats, which I highly recommend, and attribute to Dove’s long-wear and lack of chipping. I really like the packaging of Zoya’s polishes. It is not at all cumbersome and if you store your polishes standing upright in a drawer, the small cap makes it easy to view which color you are grabbing. 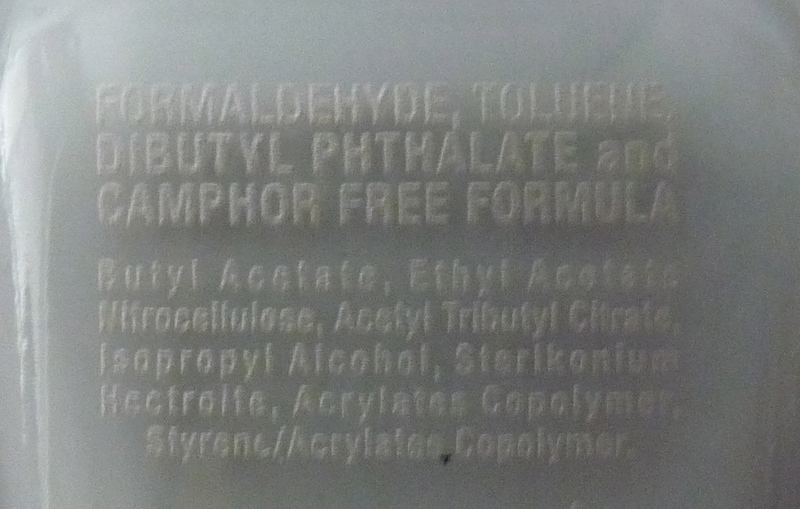 It is important to note that all of Zoya’s nail lacquers are Formaldehyde, Toluene, Dibutyl Phthalate, and Camphor free! So, if you are looking for polishes sans harmful toxins, I recommend trying Zoya. With over 300 hundred colors to choose from, you are bound to find a color you love. NOTE: Please excuse my thrashed cuticles in the swatch photos. I am working on getting them into tip-top shape. You don’t realize how bad they are until you start taking macro photos of them. Yikes! Disclosure: The product(s) featured in the post were purchased by TheLABofLuxury for review. 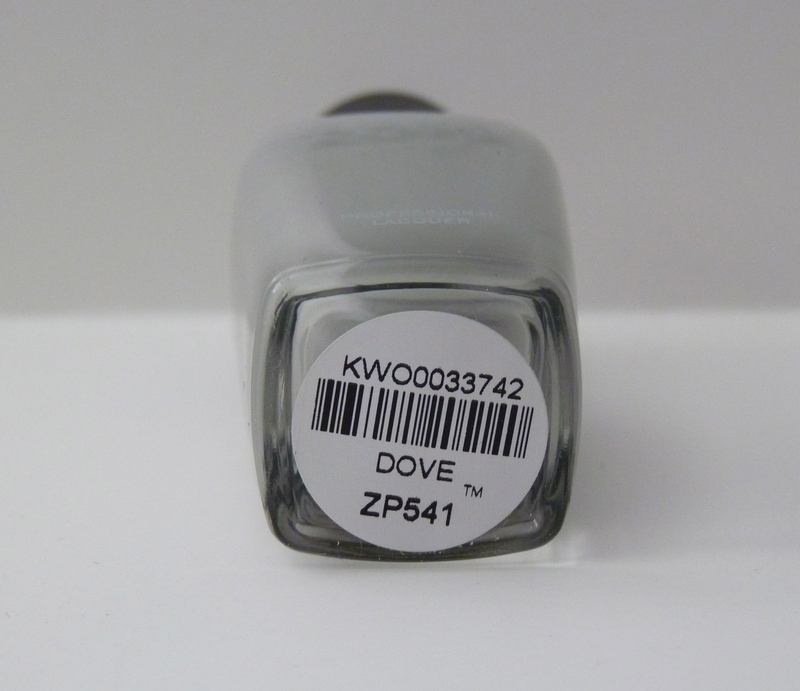 Posted on January 28, 2013, in A, BRAND, NAIL LACQUERS / POLISHES, NAILS, RATING, REVIEWS, ZOYA and tagged rating: a, zoya, zoya dove nail lacquer, zoya dove nail lacquer swatch. Bookmark the permalink. 1 Comment.